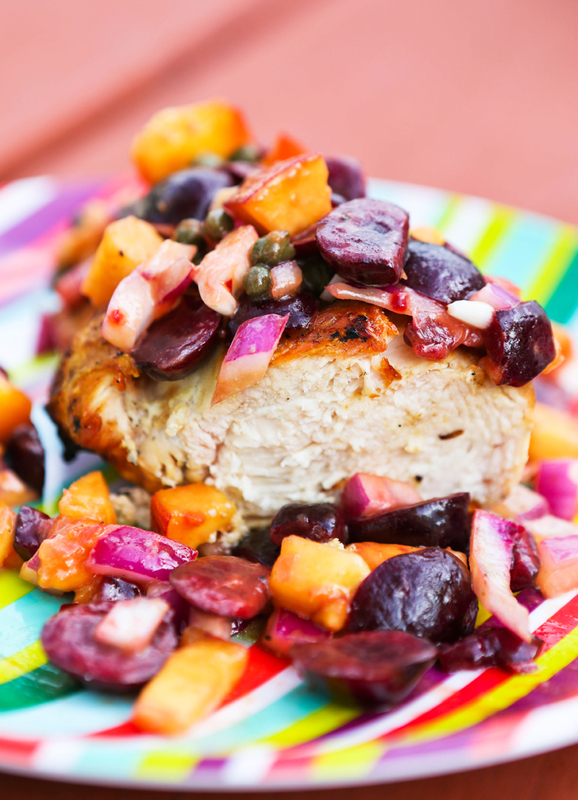 Grilled Chicken with Peach and Cherry Salsa Recipe — Pip and Ebby - easy, delicious recipes! Grilled chicken goes perfectly with this fresh, totally scrumptious Peach and Cherry Salsa! Be sure to use compliant Worcestershire and mustard if you're following the Whole30 diet! 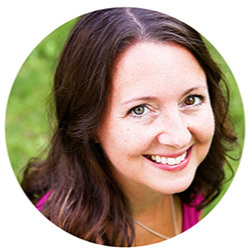 Last week as I was writing this fun post about our favorite Western United States places to visit, I mentioned checking out the fresh cherry stands that litter the sides of the roads around Flathead Lake in Montana. Then I remembered that I had made a delicious recipe with said cherries and had forgotten to write a post about it. This was not a forgettable recipe, so I blame the oversight on travel distraction. It was so addicting, healthy and yummy. I took my first bite hesitantly because I had used a few random ingredients that jumped out at me from our RV fridge. It turned out being one of those "happy accidents" we talk about in the art world. The season for fresh cherries is a short one, so replace fresh with dried if you make this out of season. The Peach and Cherry Salsa paired so well with grilled chicken, but also was great as a solo lunch salad or wrap filling. Both Dan and I were guilty of eating straight from the bowl a couple times. The weather here in Minnesota is still so ridiculously lovely that I'm still not in baking mode. Soon! Have a GREAT week! 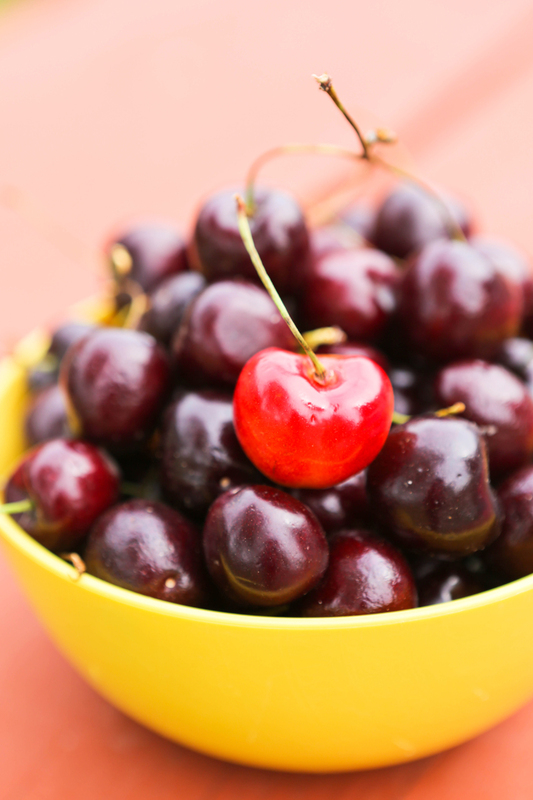 Here are a few other recipes involving fresh cherries that you might enjoy: Cherry Gazpacho Salad, Red Fruit Salad and Buffalo Sliders with Cherry Salsa! This fresh salad is delicious atop a grilled chicken breast, but can also be a wrap ingredient or solo lunch salad! Be sure to use compliant Worcestershire and mustard if following the Whole30 diet. Light a grill over medium heat. Cook chicken breasts for 7 minutes per side, or until cooked through. 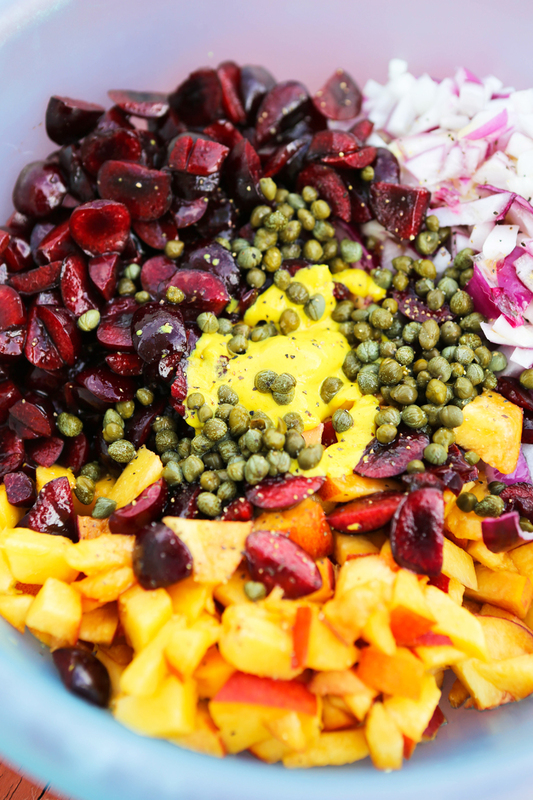 While the chicken is cooking, combine peaches, cherries, onion, capers, Worcestershire, mustard, olive oil, salt and pepper in a large bowl. Mix well. Place chicken on serving plate and top with peach-cherry salsa. Serve immediately!